SANOPAN panels are made with pasted and compressed lignocelluloses flax fibres. This product is available in different thicknesses. Its stability and its homogeneity make it ideal for a variety of different uses: partitions, door cores, worktops, roof boarding… Its flexibility opens up an even larger range of applications, such as dividers, veneer supports, packaging… SANOPAN panels are worked in the same way and with the same tools as wood. 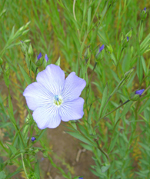 As the leading European country in applied research, France is also the main producer of flax in Europe. French flax is recognised as the best in the world and as such is sold on every continent. Flax cultures can mainly be found in between Caen and Dunkerque, carrying on into Belgium and the Netherlands. Flax is a symbol of Normandy, and especially that of the Pays de Caux, and has gained worldwide recognition for its numerous qualities, including lightness, colour, length, delicacy, resistance, and ease of production. Seine-Maritime is the leading flax region in France boasting a third of flax cultivated areas and produces a quarter of Europe’s yield. Flax is an annual plant, which is pulled out from the ground by machines (not cut) in order to keep the length of the fibres. Once uprooted, it is left on the ground out in the field in swaths. 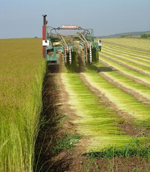 The next stage involves ‘retting’, when the fibres gradually become detached due to the alternating sun, dew, and rain. This technique is 100% natural. Then ‘hackling’ consists of separating the fibres from the ‘shives’ (unwanted material from these flax fibres), which are recycled and transformed by the chipboard panel industry. This unique characteristic means that the flax board can be used as one of the major component of fire doors. Indeed, even if it is lighter than wood chipboard, it boasts better flame resistant qualities. Flax is a sound-insulating material and the flax-fibre board easily absorbs any noise. This makes it particularly interesting for door and partition manufacturers. Flax fibre is lighter and longer than wood and the flax board is therefore more supple and resist better to torsion than traditional wood chipboard. Other than its hypoallergenic qualities, the flax board requires less glue than wood chipboard during the manufacturing process. This makes it one of the most sought after products in the building sector (lining, partitions, cladding...).